The seller told me it was a MIK but to my knowledge it is a MIC as the body is a three piece, neck is a two piece, as in joined up at the headstock, all joints are well made! 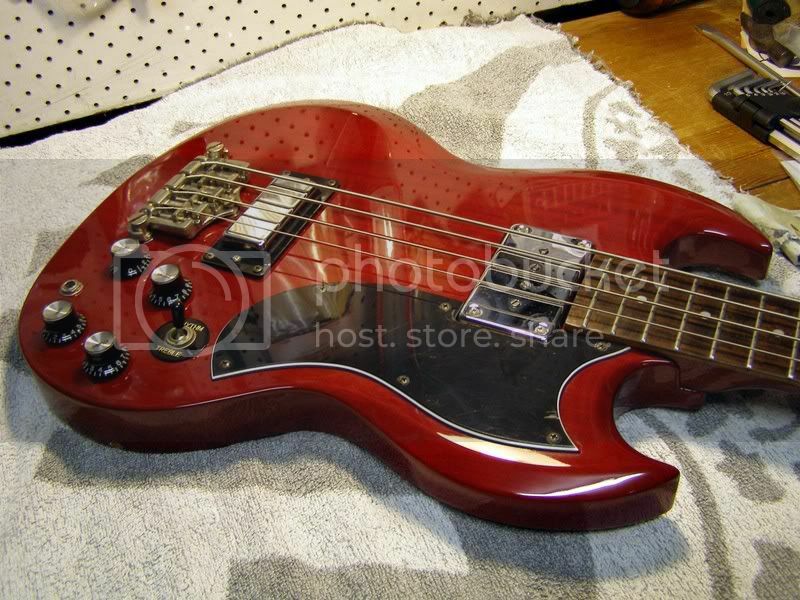 But this mediocre instrument is now a really nice player!!! Glad to hear that you have it setup to your liking. Hard for me to respond to one of the other threads about it. If it went through us, here in Oz, any issues would have been taken care of prior to it being shipped to a store. In that case, I would have been confident in repeating myself by saying something along the lines of "buy it this afternoon, gig with it tonight". I would think it is probably one of the last Korean made SGB's. 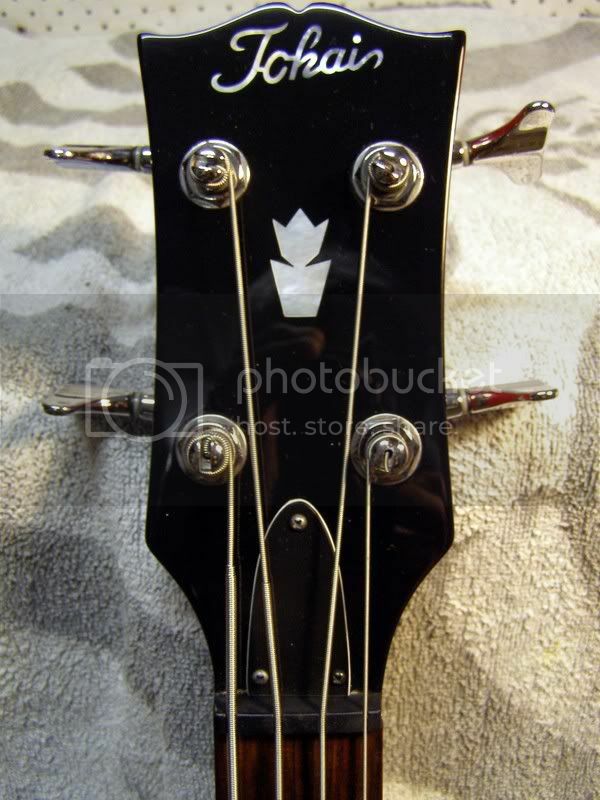 The necks and fretwok on the Chinese ALS's and SG's are actually better than the Korean made, in my experience. 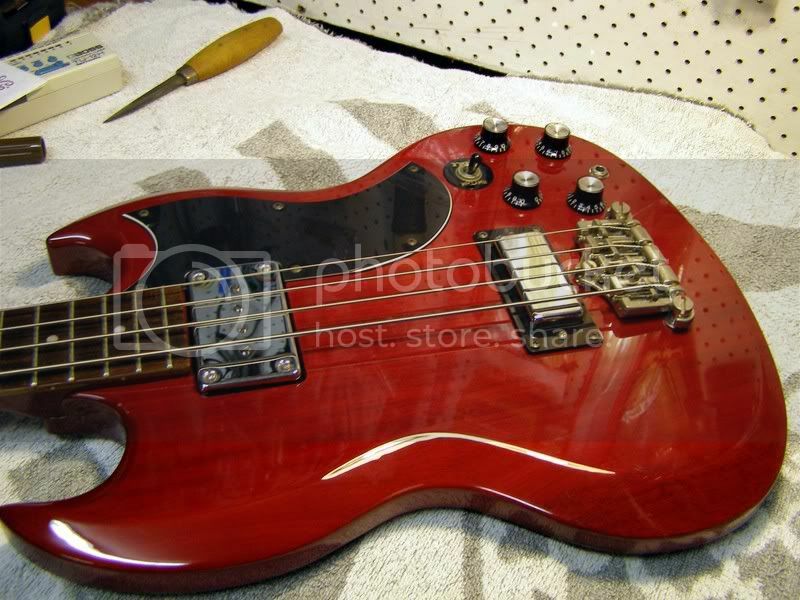 It is easier to install frets on a bolt on neck rather than a set neck, especially in the upper register where the body has to be worked around. Some of the ESB, SGB and TB's that I have handled needed a fret tapping or little level and recrowning to have them playing cleanly everywhere. Having the right tools makes it faster, with a more accurate and consistent result. Spending hours on a guitar when there are boxes of them waiting to move is just crazy. In hindsight, it would be wise to ask about the setup of any guitar before you purchase. So, Catch22 applies if you are a newcomer starting out. With all the online sellers these days, it is about price, price, price, and easy to overlook the advantages of buying locally and having the benefit of having them offer you real customer service. At least your choice of strings and a good, playable setup. Someone shipping boxes from a bedroom, or shop, in the northern hemisphere can not set an instrument up to play perfectly in the 'Gongs climate. I even adjust the necks differently when shipping to Cairns compared to Canberra, to compensate for the difference in humidity. I believe that I have a responsibility to ensure that every Tokai in Oz is a good one, irrespective of model. Given that, if there is a question asked about an SGB43, and the buyer is looking to buy locally, I will jump in and offer advice. And yes, Lest We Forget. Seemes to have a shielding coat in the cavities. What sorta string releve should I be looking for??? The neck radius should be 15" ~ 16". You can print off and cut out a rough and ready radius gauge from Chris Kinmans site http://www.kinman.com/html/toneWorkshop/radius.htm A handy little item. Around 0.010" ~ 0.015" should be a good starting point. It is a bugger to measure, though. I adjust the neck until there is no relief, and start from there. Alternating between adding relief and readjusting the bridge until it is rattle free. 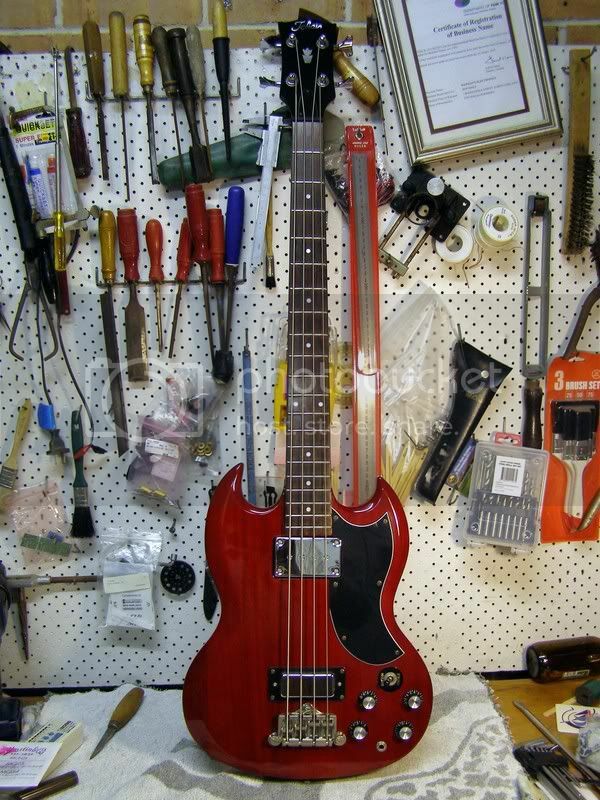 Strangely, the neck usually ends up with less relief on the bass side first, and the G string will still have some clearance.Sighting the neck can tell you where the difference is coming from. Sometimes there is the "rising tongue" around where the neck is bolted on. Other times it can be the first 3 or 4 frets where the difference is. An almost imperceptible twist. When this happens, by the time you have zero clearance on the G string, the neck is a little backbowed on the E string. 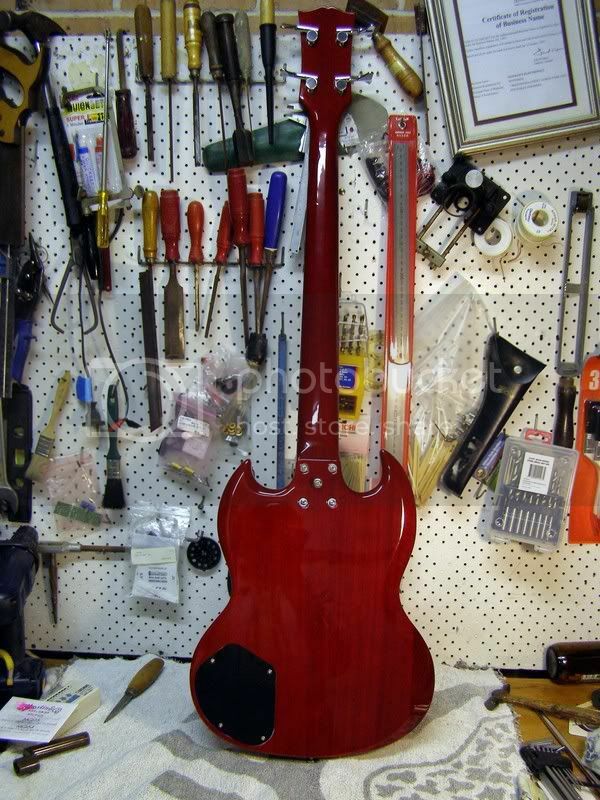 It makes it a bit tricky to get it all dead straight, but with some tweaking of the truss rod and careful fret leveling, with slightly different amounts of backbow, you can get a very good result. With out having a proprietary neck jig like http://www.stewmac.com/shopby/product/5252 you have to simulate the dead straight neck with varying tension on the rod. Kind of like an organic plek machine that can compensate and correct manufacturing tolerances, and leave the neck with some frets to play on.